Weird. No build string on the desktop, but I did spot “Send Feedback” on the Connect to network dialog! Finally! I also like the way Apple simplifies their presentations and break it down into feature sets for regular consumers to understand. Rom, that’s a reference to a Michael Jackson song. did anyone remembered the sims? I think… it’d be nice if Microsoft started using its own Silverlight platform more (example these videos). Search to open docs and applications. Dock like Taskbar. These things are so 2005 (Tiger). Apple=Microsoft’s R&D department. Congratulations Microsoft. That 90% plus market-share is well earned. The new wallpaper was included in the video. Funny! It was only present in build 7260. 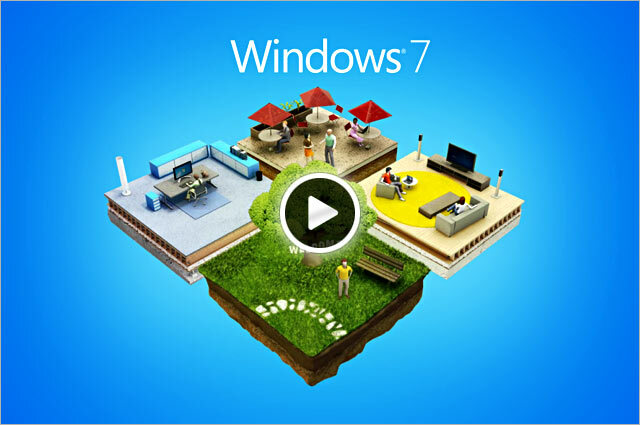 Windows 7 RTM Build 7301 is the build in the video , but it’s a temporary build made specially for the tour . anybody notice the OS font in the video looked different? It does not look like Segoe. Looks better if you ask me. @Rom: I think its just Segoe UI but its running at either 125% or 150% DPI. FYI, the taskbar has very little in common with the dock. The dock is an app launcher, the taskbar is a window manager + app launcher. If you’re referring to the fact that is has larger icons and no text, welcome to Windows 1.0 (or a dozen other things before OS X). Also you could do large icons for quick launch in previous versions of Windows, it just wasn’t the default setting as it is now. As for searching to launch programs, that’s been a part of Windows since Windows XP with WDS – which came before Spotlight. In fact, Apple didn’t make Spotlight an app launcher until Leopard, after that feature was integrated into the start menu in Vista. “Tour”? Tour my aunt fainne! I like those Apple tours (my favorite is the Mac OS X Leopard tour) but Microsoft’s videos are so short. I do like that Microsoft uses its own employees to show their products, unlike Apple that uses actors(?). @Carlos: In addition to what Brandon said, Windows Longhorn working concepts have had live, indexed searching at least a full year before Tiger was released. They’ve always creeped me out with that stuff. It’s only recently that they stopped making all their products completely white, although now it seems they’ve taken pages from HP’s design book. I guess it’s better than the all white, though. Scary. when will linux get all these features? The girl is a great voice actor and it is fantastic that Microsoft are offering these types of videos. The girl did seem pretty jittery to me though. Her hand movements were quite rigid and jerky, rather than slow and concise, made it seem she was anxious to talk about it. Still great videos, I look forward to the progression. Hrmm, This idea is really cool, but The stuff she mentioned that was ‘new’ in Windows 7 were mostly also in Windows VISTA! Microsoft knows Apple is better, that’s why they copy them like a cat. It’s just too funny… Gadgets, Superbar, Microsoft Guru, Microsoft stores…many others… and now guided tours?